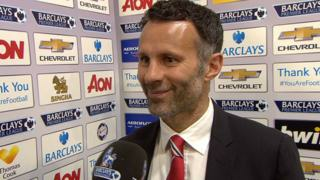 Ryan Giggs says he was pleased to "bring excitement back" to Old Trafford after Manchester United's 3-1 win over Hull City. Teenager James Wilson scored twice on his debut to put the hosts in command before Matty Fryatt scored from 25 yards for the visitors. Substitute Robin van Persie added a third United goal five minutes from time to secure the points. Giggs named himself on the bench and came on as a second-half substitute for what could well be his last Old Trafford appearance as a player, but said it was great to give youngsters like Wilson and Tom Lawrence a chance in the first team.